How to recreate an Edwardian period look to your house; your period home needs to have its 21st century comforts, but you may like to have at least some rooms decorated and furnished in an Edwardian style. This has an overview of Edwardian style, and a feature-by-feature description. Visit the pages for each room and pick out the information for this period. This has more detail than in Design by Style. Visit the pages for each element and pick out the information for this period. In Design by Element, this is a palette of typical Edwardian colours. This section will tell you how to do many restoration tasks yourself. Look for the technical advice, architectural salvage, doors, tiles, glass, baths and paints that you need. In early Edwardian houses, and in all more modest homes, avoid bright white paint; instead use off-whites or pale creams. White enamel paints became available at this time but will have been more commonly used later in the period. All woodwork in soft woods such as pine should be grained or else painted. Hardwoods such as oak or mahogany should be varnished or polished. 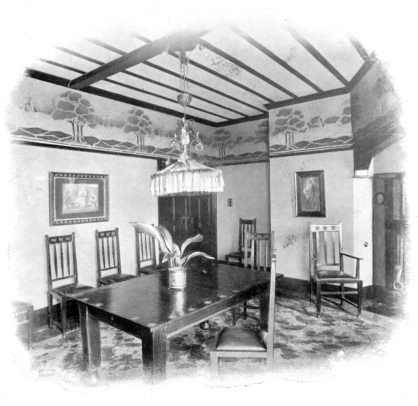 Note the stencilled frieze, central carpet revealing dark stained boards at the edges, and the beamed ceiling. Plaster and wood mouldings should be fairly simple in public rooms. Utility rooms such as kitchens do not need plaster coving. Door furniture should be of black iron in country or 'Tudor' houses, or brass in others. Use unfitted carpets and furniture. Art Nouveau designs are appropriate for all uses. Most Edwardian houses would have been furnished with some Victorian furniture, as well as contemporary pieces.